Flip Flops: Flip flops are those rubber sandals that have an open back and are on almost every trendy foot. They are quite often referred with various names such as pluggers or thongs. When the weather gets warmer it officially becomes flip flop season. Men, women, and children can keep cool by adding this summertime footwear to their wardrobe. Flip flops are a great accessory for any wardrobe, being both stylish and comfortable. They are a staple in every summer wardrobe and can make great gifts as well! Personalize your very own pair of flip flops. Imagine being able show off your own stylish design or company logo! Flip flops make an absolutely amazing marketing tool! Everyone is wearing them this summer and what better way to use a creative avenue as advertisement. You could add your company logo, motto, or any number of designs to help boost awareness and knowledge of your company or product line. 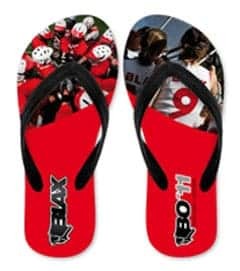 With our sublimatable flip flops you can print your logo, text and pictures on the upper sole in photo quality. The possibilities are endless. Flip-Flops are available in Large, Medium and Small sizes. Qty 20/case – Broken cases billed as each. * Prepare artwork and size transfer according to the size and shape of the product. * Place a sheet of plain white paper on the press. 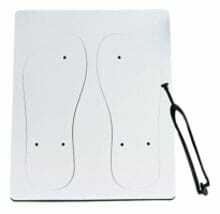 * Lay the imprintable face up on the heat press so that you are pressing onto the transfer. Note: These instructions are guide lines only and are based on the inks, paper, and products we supply. Your inks, papers, etc. may require adjustments in your time/temp settings. Receive e-mails with specials, discounts, tips and tricks and latest updates.